of leaves due to the presence of defensive compounds, incorrect allocation of tropical invertebrates to trophic roles, or failure to detect the presence of large shredders (Irons et al. 1994, Schofield et al. 2001, Wantzen et al. 2002). In contrast to some reports of low shredder density in tropical streams, Cheshire et al. (2005) found that shredders represented 20% of total macroin-vertebrate abundance in the Australian tropics, similar to values reported from the temperate zone. These authors suggested that shredder scarcity may reflect historical biogeography rather than a strict latitudinal effect, because in some temperate regions such as New Zealand, shredder insects also are scarce. Where shredder insects are rare or absent, other organisms may play a similar role. Fish and shrimp enhanced leaf breakdown in a Costa Rican stream (Rosemond et al. 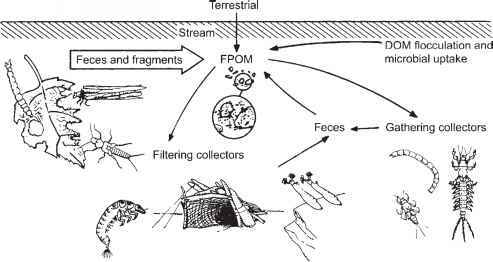 2002), as did shrimp and macroinverte-brates in a stream in Puerto Rico (Wright and Covich 2005). In New Zealand headwater streams, the crayfish Paranephrops zealandicus has a strong influence on the decomposition of leaf litter and the production of POM (Usio and Townsend 2001). Macrophytes are an important source of detritus where they are abundant, typically in larger rivers and in floodplains (Section 6.2). Polunin (1984) reviewed studies of the decomposition and fate of this material, which is similar to that of terrestrial leaves. Breakdown rates are relatively fast, although less so for emergent macrophytes that contain more support tissue. Bacteria appear to play a greater role in macrophyte decomposition than is true for leaves of terrestrial origin (Webster and Benfield 1986). Wood ranging from small branches to large tree trunks is abundant in small to midsized streams flowing through forested landscapes. Wood influences channel structure and stream habitat in a number of ways (Section 5.2.2), and also contributes to the nutrition of some consumers (Anderson and Sedell 1979). Not surprisingly, wood decays very slowly. The high lignin and cellulose content of wood fiber, combined with low concentrations of N and P, relatively small surface area, and low penetrability, results in very slow breakdown with microbial activity confined to surface layers. Even small wood chips (0.75-1.5 cm size range) placed in coarse mesh bags in Quebec streams showed very slow loss rates (Melillo et al. 1983). Alder chips (A. rugosa) had a half-life of about 7 months, while spruce (Picea mariana) chips would require roughly 17 years to undergo a 50% reduction in weight. Anderson et al. (1978) retrieved sticks (2.5 x 2.5 x 92 cm) of alder, hemlock (Tsuga), and Douglas fir (Pseudotsuga) after 15 months in an Oregon stream, with similar results. Webster et al. (1999) estimated breakdown rates for sticks of different diameter (<20 mm, 20-25, and >25 mm) of yellow poplar (Liriodendron tulipifera), white pine (Pinus strobus), and red oak (Quercus rubra) in a 5-year experiment conducted in streams at Coweeta Hydrologic Laboratory. Breakdown rates were more rapid for sticks of smaller diameter, and for poplar relative to the pine and oak. Breakdown rates for sticks were 1-2 orders of magnitude slower than those reported for leaves of woody plants. Logs (20-32 cm diameter) that were placed in this stream lost their bark after 4-5 years and showed some signs of surface decomposition after 8 years, but still no differences in density were detected. Natural wood pieces, such as branches and twigs, have slower decomposition rates than commercial wood substrates such as chips, sticks, cubes, and disks, probably because of the latter having a higher surface to volume ratio and because leaching losses are higher from the processed surfaces of wood products (Spanhoff and Meyer 2004). Nutrient availability may have some influence on wood decomposition. Comparison of alder, pine, oak, and eucalyptus branches at three sites in the Aguera River, Spain, that differed in nutrient levels suggested P limitation of wood breakdown (Diez et al. 2002). An initial weight loss (5-9%) due to leaching occurred during the first few weeks, and P was rapidly lost during the first 6 weeks in all but eucalyptus. Breakdown rates were most rapid for alder, followed by oak and eucalyptus, and then pine, which also showed the lowest values of ergosterol. In two streams in Germany the decomposition rate for black alder (A. glutinosa) was higher and the half-life shorter at a site with higher nitrate and phosphate levels (Spanhoff and Meyer 2004). Experimental addition of nutrients enhanced the decay of wood (oak veneers and natural maple sticks), more so for veneers than sticks (Gulis et al. 2004). The faster breakdown rate of the veneers was accompanied by higher N and ergosterol content and microbial respiration, which was thought to be primarily fungal (Figure 7.11).